Corporate Bond Newsletter - 2018 September - English | Lysander Funds Ltd.
What a summer it turned out to be! It was anything but boring as the news kept up a steady pace of upheavals. Former fixer Michael Cohen flipped and became a cooperating witness. His former boss President Trump vented his fury at this betrayal on Twitter. Quarterback and Heisman Trophy winner Johnny Manziel gave the Canadian gridiron a try. He promptly threw four interceptions in his first go at the three down Canadian football game and flopped. France took flight at the soccer World Cup. “Les Bleus” flew home with the World Cup, leaving their footy foes England and Germany feeling blue at what might have been. The “Emerging Markets” turned into submerging markets. Financial feathers flew as Turkey “turkeyed” when US financial and economic sanctions took hold. Turkey’s economy and its financial system lived up to their national moniker and the financial markets gave them the proverbial bird. Saudi Arabia verbally abused Canada for having the temerity to insist the Saudis treat people fairly. Venezuelan President Maduro dodged a drone attack while droning on in a speech. Maduro then devalued the Bolivar and watched the Venezuelan economy sink further into a black hole of “Socialist” and “Peoples” corruption and ineptitude. The NAFTA renegotiations dragged on and global tariff wars morphed from rhetoric and campaign speeches into reality. Those Americans who elected the “Reality President” to shake things up are certainly getting what they bargained for. The drama from Washington has been non-stop. If you or your pals weren’t charged, convicted, or attacked in an anonymous opinion piece, then you must not work in the White House. The dramatics and political machinations around the Trump administration are Shakespearean, but we wonder what can possibly get done with all the turmoil at the highest level of the US government? The major lesson seems to be to never take a call from Bob Woodward! Size did matter in the business world. Apple topped $1 trillion in market capitalization and Amazon followed soon after, the first global public companies to do so. AT&T and Disney closed their landmark and massive M&A transactions. Elon Musk, who wants to electrify automobiles, provided some electric moments as he imploded emotionally and quite publicly. His Twitter feed proved problematic with regulators as he mused about turning Tesla into a private corporation, away from the pesky financial analysts who actually question his obvious genius. Sadly, an automobile legend, Canadian-Italian and Fiat Chrysler CEO, Sergio Marchionne, passed away. Morphing from a Canadian accountant to successfully running a massive international conglomerate was quite an accomplishment. Although the weather was unseasonably warm, it remained tough sledding for fixed income as the table below of FTSE debt market returns shows. With yields backing up after decades of declining yields and increasing bond prices, a positive return for bonds has become something to brag about. Canada bonds ended June 30th returning 0.4% over the quarter and -0.1% for the prior 12 months. A little yield spread was necessary to “accentuate the positives” in bonds. Provincials, benefiting from longer duration and a flattening yield curve, fared better, returning 0.8% and 1.3% over the quarter and one-year periods, respectively. Higher credit spreads saw the Corporate Bond Index more than compensate for higher short term yields with a 0.4% return for the quarter and 1.2% for the year. One can’t pick up a newspaper (or surf the business section of the internet for our readers under the age of 60) without reading a story about the flattening US yield curve. Many say that the predictive power of the US yield curve shows that a recession must be just around the corner. That the US yield curve is flatter is a fact. The chart below shows the current US yield curve versus the average curve over the last 5 years. Today, the curve from 2-year bonds to 30-year bonds is a mere 42bps positive versus an average of 195bps positive over the last 5 years. Since Q3 2016, the curve has flattened 113bps. The critical question is why? Is a recession really imminent or are other factors influencing the shape of the US yield curve? The latest US GDP figure registered an impressive 4.2% annualized growth rate, so we confidently write the US is not in recession. Those predicting a US slowdown ignore the factors that suggest positive growth could carry on for quite some time. These factors include the impact of low interest rates, tax cuts and increased government spending. Fueling the continued economic expansion are still extremely low interest rates. Granted, the Fed Funds rate at 2.0% is considerably higher than the 0.25% emergency rate employed by the Fed post Credit Crisis for the seven years from December 2008 to December 2015. Even following 7 Fed rate hikes of 0.25% each, interest rates remain extremely low by historic standards. Were the Fed to raise rates 25bps at two of at its remaining three 2018 meetings (September 26, November 8, December 19 announcement dates) it would still leave the Fed Funds rate 40bps below the period average of 2.9% depicted in the chart above. Perhaps the biggest beneficiary of the low for long Fed interest rate policy is the US government itself. It is remarkable to note the impact of nearly 10 years of emergency levels of interest rates on the US fiscal situation. For the fiscal year ended September 2008, interest expense on US debt totaled $454 billion. For the fiscal year ended 2017, that number remained virtually unchanged at $459 billion. During the intervening period, the stock of US debt outstanding increased twofold to $20 trillion. Said another way, if rates were the same in 2017 as they were in 2008, the US deficit would have been $450 billion higher. In addition to still accommodative monetary policy, the US government is providing extraordinary stimulus to the already healthy economy. The Republican controlled government has unleashed an expansionary cocktail consisting of tax cuts and government spending increases. The chart below illustrates the fiscal impact of the stimulus measures implemented by the President and his enablers in the GOP. The steadily improving fiscal picture under the last years of the Obama administration has given way to projected deficits in excess of $1 trillion dollars each year for the period 2019 – 2028. The Republican Tea Party outrage at government spending and deficits severely limited the fiscal response in the aftermath of the Credit Crisis and Great Recession. Now the “fiscal conservatives” are Trump boosters and spending government money with joyous abandon. They are financing the spending with deficits never before seen outside of wartime budgets. We think this is both extraordinarily stimulative and financially reckless with the US economy running strong. We acknowledge US economic activity is being supercharged in an unconventional, arguably unwise and likely unsustainable way. This is all a reflection of the unconventional, arguably unwise and likely unsustainable administration overseeing the world’s greatest Republic at the moment. Nevertheless, we don’t see the US economy grinding to a halt anytime soon. Even if the “Forever Trump” Republicans are wiped out in the October mid-terms, it is hard to see a Democratic Congress reining in spending with their stated agenda. The ongoing impact of the Federal Reserve’s quantitative easing program. Voluntary, non-recurring US pension plan contributions. The composition of the US government borrowing program. Deficits and future debt financing requirements of the US government. The first three explain the current flat yield curve and the last is the key driver in the steepening of the yield curve we expect to come. In response to the Credit Crisis, the Federal Reserve first lowered the overnight rate to 0.25% where it then stayed for 7 years. The Fed also launched a series of “asset purchases” known as “Quantitative Easing”, originally targeting the purchase of shorter dated US treasury bonds and mortgage backed securities. In an effort to drive longer term interest rates lower, the Fed launched operation TWIST. TWIST involved selling shorter dated securities to buy longer dated securities. As a result of Operation TWIST, the Federal Reserve owns 1/3 of all long-term US treasury bonds with maturities greater than 10 years. The Fed is reducing the size of its balance sheet by letting shorter treasuries mature without replacing them. It has not been selling long-term bonds which we think is dramatically affecting the shape of the yield curve. If I told you that I owned all of the real estate in Manhattan and it was all for sale except the high rises, you would logically conclude that the reduction in supply would make the high rises considerably more valuable than the low rises. 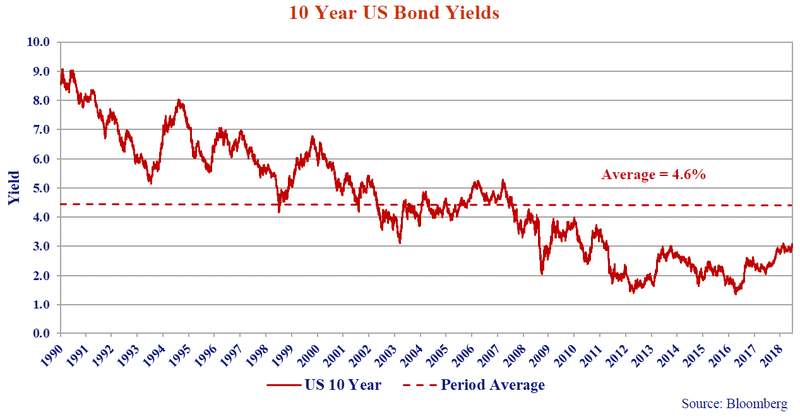 In the bond world, more valuable means rising prices and falling yields – a flatter yield curve. When it comes to the Fed and its US treasury holdings, people seem willing to discount its importance and the magnitude of its impact on the market. The Federal Reserve is no longer buying long US treasuries, but in its place US pension plans have temporarily increased their purchases. General Electric, PepsiCo and Verizon are just a few of the companies who made voluntary contributions to their pension plans in advance of the September 15 deadline when the tax incentive for these payments dropped from 35% to 21%. As many pension plans maintain a large fixed income weight to offset their pension liabilities, it is a certainty a percentage of these “extra” contributions were invested in fixed income and some portion in long US treasuries. In addition, the funding deficits caused by plunging bond yields and discount rates were not enjoyable for pension sponsors. Human nature suggests that many sponsors are now buying the longer term bonds that they should have had when yields hit their lows in 2016. All of this incremental buying has the effect of keeping downward pressure on long bond yields. The US Treasury Department manages the borrowings for the US government. This includes determining what quantities to borrow, in what maturities in the debt markets. As deficits rose, the Treasury increased the size of borrowings in the front end, including raising the size of bill auctions, 2-year, 3-year and 5-year note auctions. The Treasury also introduced short dated floating rate notes. Only in the last announcement did the US Treasury take the first steps to increase long bond supply. As long as the curve remains positively sloped, it stands to reason the government would borrow shorter term where rates are lower. US government borrowing requirements are now increasing substantially and ultimately the size of the long bond auctions will increase. This will occur in the absence of the Federal Reserve as a buyer. US pension plans will also return to a more normal level of plan contributions with the expiration of the previous tax regime on September 15th. These will both happen together, and the market will need to determine the appropriate price for a 30-year US treasury bond in their absence. We are very skeptical that this price will equate to a yield anywhere near 3.23%. The latest estimates from the Congressional Budget Office (CBO) project the US “Debt Held by the Public” will increase from $14.7 trillion at the end of fiscal year 2017 to $28.7 trillion dollars by 2028, as the chart below shows. This is a massive $14 trillion increase and a doubling of the “Debt Held by the Public”. Add on the debt held by the US Social Security system (the US government’s largest creditor) and total US government debt is projected to climb to $33.9 trillion by 2028. The US Debt to GDP ratio is projected to reach 114% by 2028. A recent article by Heather Long in The Washington Post put the growth in US debt in context and her comments only capture the growth in debt through 2018! The historic growth in US government debt is stunning. The projected growth over the next decade is hard to fathom. Washington’s lack of concern about burgeoning deficits, skyrocketing debt and deteriorating credit metrics is mind-boggling. That the projections are based on average annual GDP growth of 4.1% over the period is even more frightening. Perhaps the Trump Reality Presidency has left little room for serious economic discussion or he has cowed the true economic conservatives with his Twitter tirades. We do see a day of reckoning coming as the current administration policies result in the dramatic deterioration of the credit quality in the Land of Liberty. On August 5, 2011, Standard & Poor’s downgraded the long term credit rating of the United States of America to AA+ from AAA. S&P cited “political brinkmanship” in the approach to the debate over the debt ceiling as one of the reasons for the downgrade. We find this particularly funny given the polarized nature of Washington today. Uncontrolled spending driving skyrocketing deficits funded by debt spells a rapid deterioration in the credit quality of the US. Add to it the general mismanagement to bring the situation back to solid footing suggests a credit downgrade is not only possible but probable. At present, DBRS, Fitch and Moody’s continue to rate the United States AAA. It would seem if ever the credit rating of the world’s superpower was in jeopardy, now is the time. US 10-year yields closed at 3.08% today, a far cry from the all time low of 1.36% recorded on July 10, 2016. This is also a far cry from its average of 4.56% going back to 1990. Over the summer months, every time 10-year yields touched 3.0% the media went into hysterics. The thought being either the end of the world was nigh, or yields were about to plummet as the market came to its senses. In this most recent period of consolidation, it would appear the market is either comfortable or resigned to US rates moving higher. This publication is called the Canso Corporate Bond Newsletter and it is appropriate we should say a few words about the corporate credit markets. Canadian investment grade spreads remain largely unchanged month over month, while US investment grade continues to leak wider, albeit from a much tighter base relative to historic averages. On August 31st, high yield spreads closed at 349bps, 219bps tighter than their historic average of 568bps. The chart below shows that this low level of junk bond spreads was only previously seen from 1995 to 1997 and from 2004 to 2007, just before the massive credit sell offs in 1998 and 2008. As we write this and consider the dates of the prior sell-offs, it strikes us that the peak of the nascent 1980s junk bond market occurred in 1988, just before high yield bond maven Michael Milken went to jail for market manipulation and insider trading of junk bonds. We cannot help but wonder whether 2018 will experience “The Curse of the Eights”. A major issue to us is that in these previous periods, high yield bonds were usually the senior part of the capital structure, with equity and subordinated bonds giving some cushion to the senior creditors in a default. In the current credit marketplace, significant amounts of leveraged bank loans rank before high yield bonds. The high yield bonds with tight current spreads rank behind the bank debt, which means they will fare much worse in default. We believe the downside to the current high yield investor is much, much higher. This higher risk is not compensated for by higher yield spreads. This makes us very wary of the downside risk. As our clients and readers know, Canso continues to caution against the down in credit quality trade. In an era when spreads are tight and covenant protections eroded, investors are not compensated for the risk of owning high yield. There are of course always exceptions and we own several special situations, but in aggregate the risks of high yield do not justify the potential reward. With yields low, risks of rising interest rates and credit deterioration high in both Canada and the US, many investors have asked us why they just shouldn’t “Buy GICs”. After we point out that GICs are non-marketable bonds issued by banks at lower yields to the unsuspecting, we also emphasize the role that fixed income is meant to play in a portfolio. As a preserver of capital. Fixed income can and should act as a preserver of capital. People don’t expect to lose money in fixed income. An actively managed bond portfolio can both mitigate risk and take advantage of opportunities when they arise. We also inform investors about floating rate bonds and the important role they play in our portfolios in a period of rising yields. The markets ooze temptation. Higher yields lure unsuspecting investors out the yield curve or down in credit quality to pick up a few extra basis points. We once again advise that this is a recipe for disaster in today’s markets. Economic growth, fueled by extraordinary stimulus, ensures the path for administered interest rates is higher. The Fed will move at a faster pace than the Bank of Canada (BOC) but make no mistake, the BOC will be moving in the same direction. Long term bond yields are expected to rise substantially. Credit spreads offer little reward for risks assumed. At the current moment, the word “conservative” has been co-opted for the most reckless political and economic behaviours despite what Maxime Bernier (Canada), Malcom Turnball (Australia) and the US Republican party might tell you. People selling their investment services have misused this word for years and now the politicians seem to be joining in. We have never been “conservative” investors. We are not “conservative” in our credit selection, we merely demand that we be compensated for the risks we assume. We are presently seeing immense credit risks being assumed by the unsuspecting and the returns on offer today are scant compensation. We assume credit risk when we are compensated for it and today we are not. Our current portfolio fate will be forced to higher quality by our value discipline. Our bias has been and continues to be, to invest in high credit quality floating rate notes, and higher quality bonds in general. There will inevitably be cheap bonds available sometime in the future, but that time is definitely not now.